On a budget and looking to make the most of it? We’ve decided to put together a useful list of 100 of the best watches under £100. 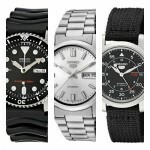 We figured this sort of list would be perfect for those who prefer affordable watches. Of course, there is the odd model in today’s list that does push the budget a tad, this is just to show you what you could achieve for a little extra. There’s a huge selection of affordable watch brands on show with many recognisable names like Sekonda, Seiko, Casio, Armani, and more. This list has taken quite some time to put together and includes a variety of designs and styles so there should be something to suit everyone. Obviously, if I’ve missed a watch you believe deserves to be in this list, comment and let me know and it may make it into the next update. As always, don’t forget to comment at the end and let us know what you’re favourite affordable watch was from today’s list. I hope you enjoy. 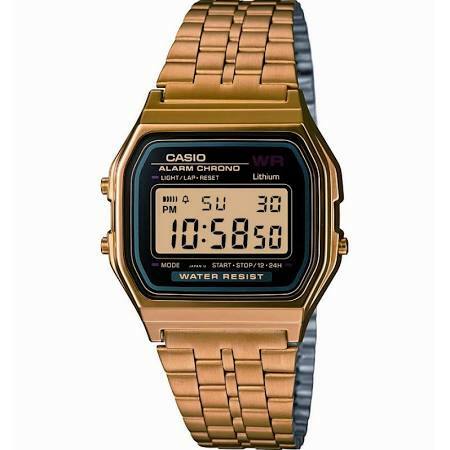 First up in our list of the best watches under £100 is this extremely popular Casio. While it may not look like much, this little timepiece has proved to be one of the best affordable watches for quite some time. It has a nice selection of functions compacted into a solid resin structure. It’s actually available in a whole range of colours, so if you fancy a yellow or pink, then you can get those too. 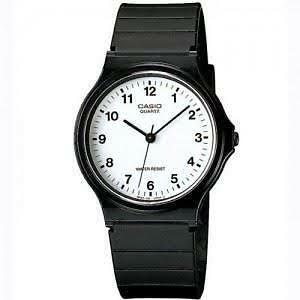 Next up we have another one of the best cheap watches from Casio. 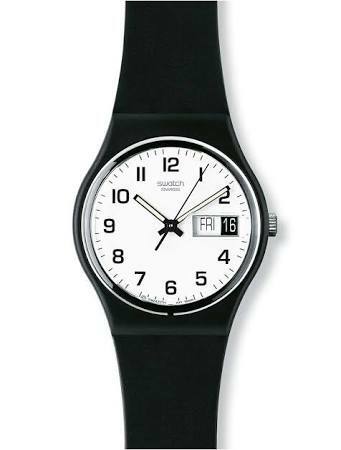 This classic Casio has a monochrome finish and is made with a plastic/resin blend. It has a high visibility contrasting display with black numeral hour markers and black hands. This watch is ideal for those seeking something cheap to simply tell the time with. You can read my full Casio MQ-24-7BLL review here soon. Daniel Wellington are well known for their affordable minimalist watches. This classic timepiece is the Sheffield black. It has a 36mm casing diameter making it ideal for a unisex watch. The black dial and strap is complimented nicely by the rose gold PVD plated detailings. It runs on a Japanese quartz movement and has a basic 30m water resistance rating. You can read my full DW00100139 Daniel Wellington watch review here. 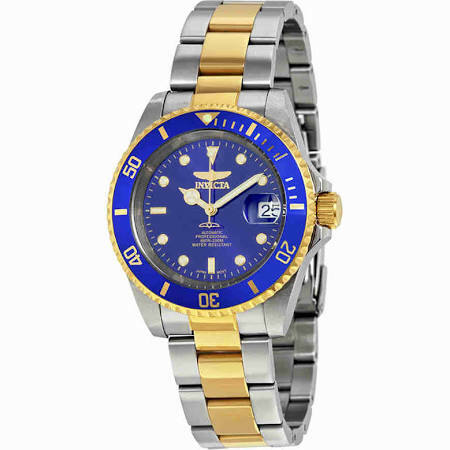 Here we have a stunning watch from Invicta’s Pro Diver collection. This affordable automatic watch runs on an automatic self winding movement that can actually be viewed through the exhibition style caseback on the rear of the watch. There’s a date display on the dial which features a magnifier window positioned above it to enlarge the print, making it easier to read. The hands and hour markers are also coated in lume for easier reading in dim lit conditions. As you’d expect from this style of watch, it also features a 200m water resistance rating. Not bad for an affordable watch in this price range. You can read my full 8928OB Invicta watch review here. Up next we have another popular Daniel Wellington timepiece in our list of the best watches under £100. 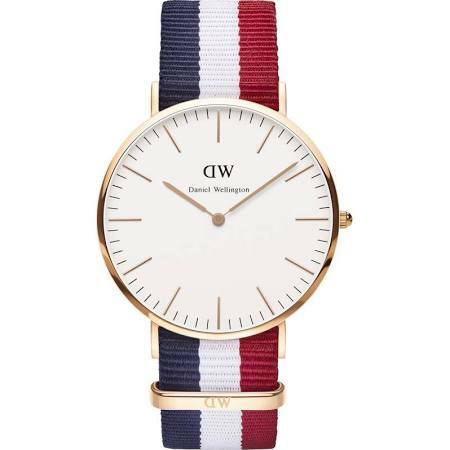 The Cambridge by Daniel Wellington is a 40mm watch with a rose gold PVD plated casing and a blue white and red coloured nylon style strap. The cream dial goes beautifully with the rose gold detailings of the hands and hour markers. 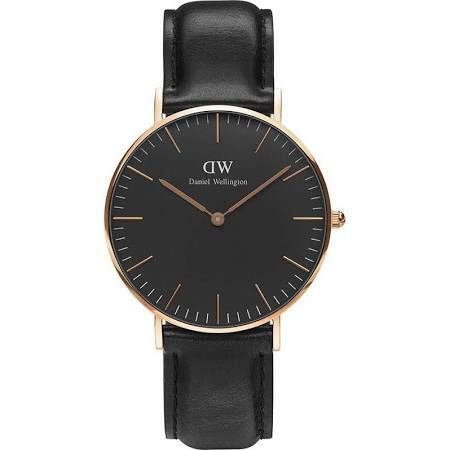 Another beautiful minimalist watch from Daniel Wellington. You can read my full 0103DW Daniel Wellington watch review here soon. Casio’s range of G-Shock watches are an excellent example of the high quality watches under £100 that you can get. If you’re looking for something tough and durable then G-Shock watches are often worth considering. These watches have a thick resin protecting the watch, with a mineral crystal glass protecting the dial. It’s a shock resistant construction that protects against impact and vibration. As is typical with Casio G-Shock watches, this model has a highly functional build with lots of useful features like a stop watch, alarm, and countdown timer. You’ll likely be impressed by the 200m water resistance rating too. These are oversized watches, so if you like the idea of a 51mm casing diameter with a chunky 17mm thickness watch on your wrist, then go for this. You can read my full GA-100-1A2ER Casio G-Shock review here. 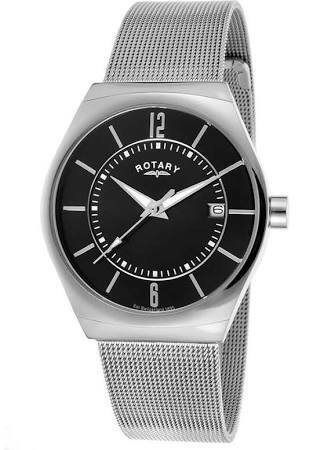 Rotary are another one of the most popular affordable watch brands available. They have a nice selection of popular watches under £100. This model has a smart looking classic style dial with Roman numeral hour markers and a small date display at the 6 o’clock position. It runs on an accurate and reliable quartz movement that requires very little maintenance. The strap is made of a soft genuine leather and fastens with a buckle style clasp. You can read my full GS00325/06 Rotary watch review here soon. 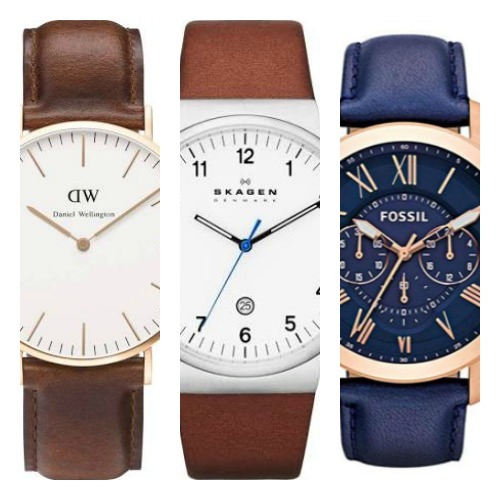 Up next we have a very affordable classic watch in our top 100 best watches under £100. 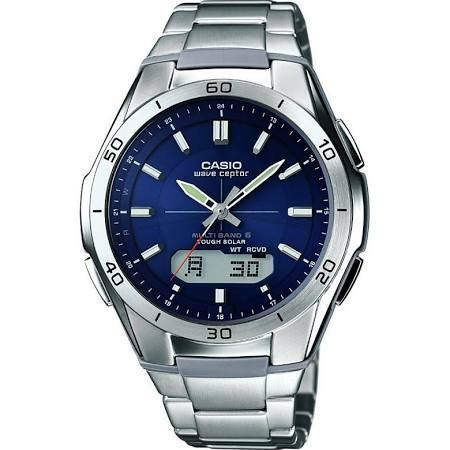 This digital Casio watch is made from a chrome plated resin and stainless steel. It’s powered by a chronograph quartz Japanese movement and has a date, alarm and backlight function. If you’re after a retro watch, these classic Casio timepieces are worth checking out. You can read my full A164WA-1VES Casio watch review here. Another good inexpensive watch, this time from Casio’s G-Shock collection. This model features a dual digital analogue display, with the option of using whichever you prefer. 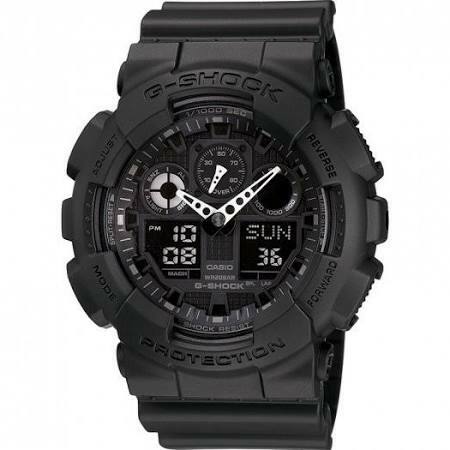 As is common with G-Shock watches, this model has a tough and durable resin design the protects the watch from drops and shocks. It features a stopwatch, countdown timer, multi time zone, and a 200m water resistance rating. You can read my full GA-400-1BER Casio G-Shock watch review here. 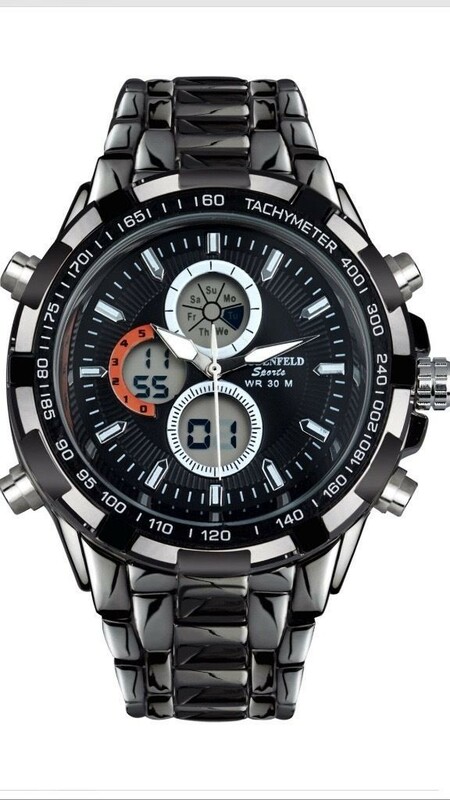 This multi function sports watch by Globenfeld has proved to be a popular seller recently. It features a popular dual display with both analogue and digital dials being put to use. The watch runs on a reliable quartz movement and has a stop watch and alarm function. You can read my full Globenfeld watch review here soon. 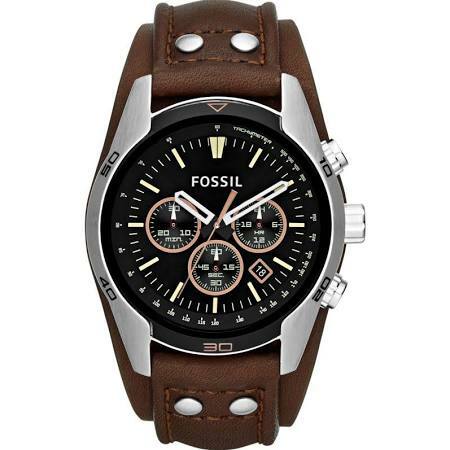 Here we have an affordable chronograph watch from Fossil. This affordable watch brand features a nice wide selection of styles and designs. This model has a chronograph display and runs on a Japanese quartz movement. The black Ion-plated casing goes nicely with the dark brown dial and genuine leather strap. You can read my full FS4656 Fossil watch review here. This is another affordable chronograph watch from Casio’s durable G-Shock collection. It’s a rugged dual display wristwatch that features an alarm, chronograph, timer, backlight, and world time display. It’s powered by a Japanese quartz movement and has an impressive 200m water resistance rating. 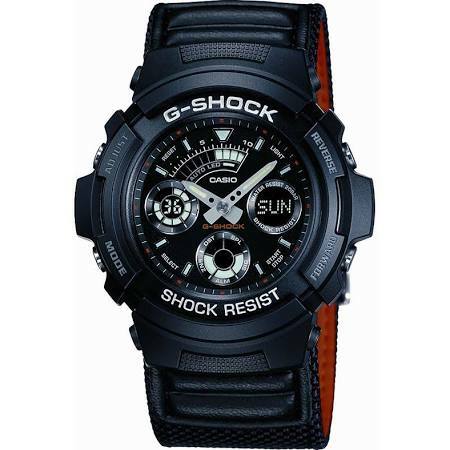 This fabric strap G-Shock watch has proven popular in many of our best selling lists. You can read my full AW-591MS-1AER Casio G-Shock review here. 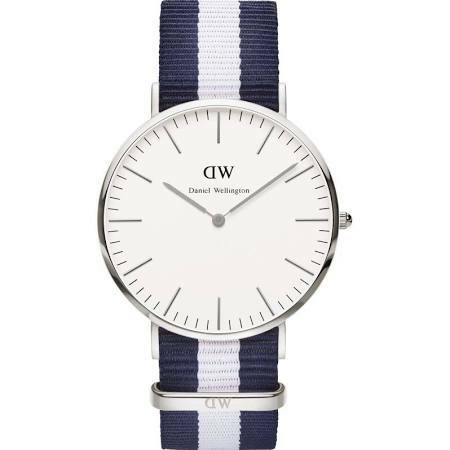 Here we have another popular minimalist watch from Daniel Wellington. This affordable watch brand features a lot in our top 100 minimalist watches for men. The St Mawes Daniel Wellington watch is a classic timepiece with a minimalist dial. The cream coloured dial features PVD rose plated detailings for the hands and hour markers. It runs on a Japanese quartz movement and has a basic 30m water resistance rating. You can read my full 0106DW Daniel Wellington watch review here. 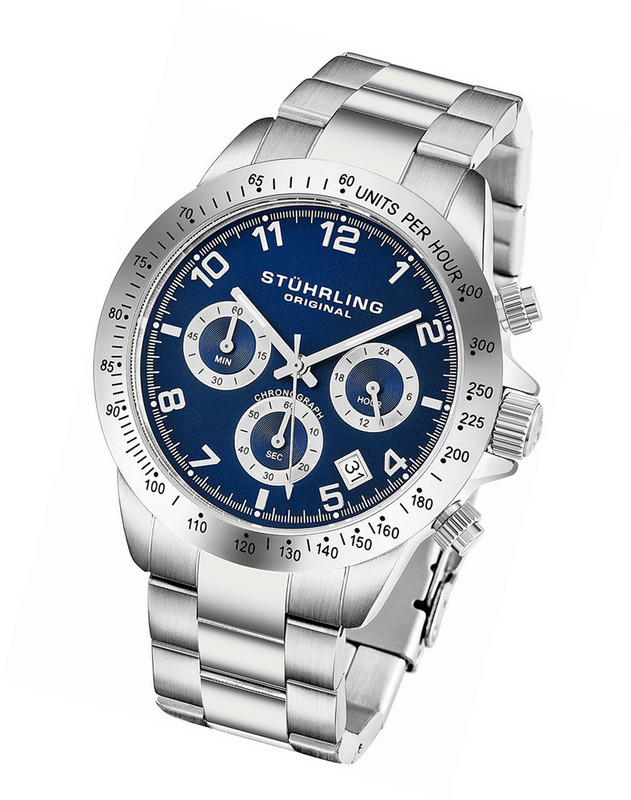 Up next we have an affordable sports watch from Stuhrling. This chronograph watch has a nice 40mm round stainless steel case with a polished fixed bevelled bezel. The blue matte finish of the dial really draws the eye into the watch. This Stuhrling watch runs on a Japanese Seiko VD53 quartz movement and has a 50m water resistance rating. You can read my full EU665B.02DE Stuhrling watches review here soon. 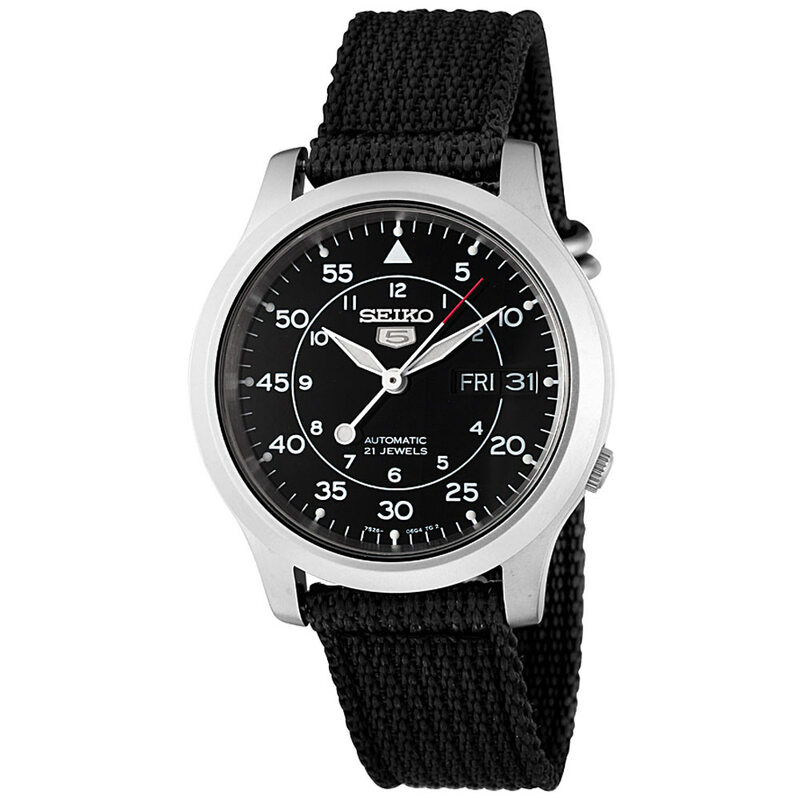 Up next on our list of the best watches under £100 is the extremely popular Seiko SNK809. This watch is part of the Seiko 5 collection. 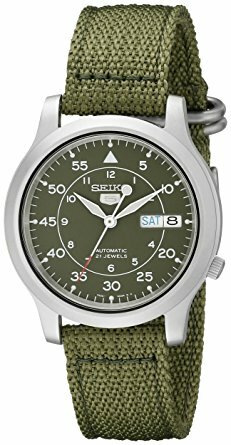 A selection of watches that aim to build quality affordable automatic watches, this is why many of the Seiko SNK series are so popular. They are affordable and well built, as such you’ll find a few of the colour variations lower down in this list too. The Seiko SNK809 runs on a 21 jewel automatic mechanical movement, it features a high visibility contrasting display with lume and a day and date display on show. You can read my full SNK809 Seiko watch review here. 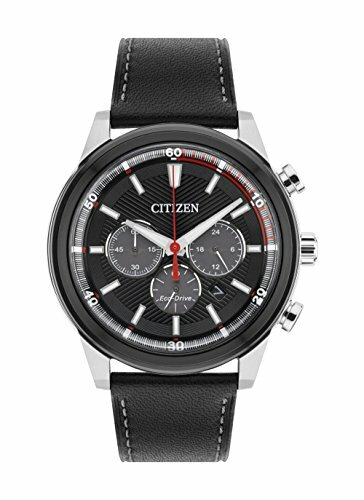 This is another popular affordable watch, this time from Citizen. The Eco-Drive technology proved so popular, it’s now featured in the large majority of their new watches. This Eco-Drive technology allows the watch to be powered by light, any light be it natural or artificial. This chronograph watch comes with a contrast stitch padded leather strap and has a decent 100m water resistance rating. You can read my full CA4348-01E Citizen watch review here. This is a decent cheap men’s watch for those of you out there looking for something simple with a large digital display. It’s a generic style watch that’s available in a few different brands. That being said, it’s very affordable and pretty popular as far as cheap watches go. It runs on a Japanese quartz movement and has a 24 hour time display and a calendar function. You can read my full Civo watches review here soon. 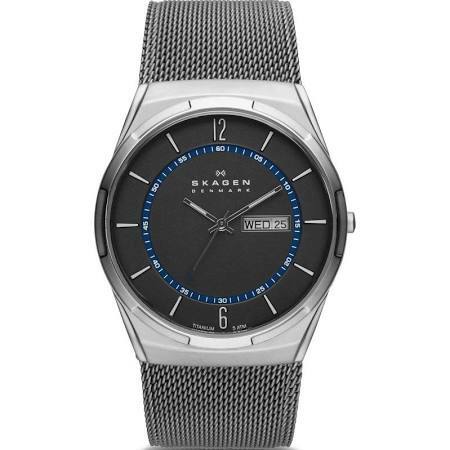 Here we have an affordable titanium watch from Skagen. 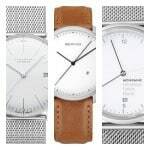 This is a brand based in Denmark that produces many minimal watches that are often very affordable. 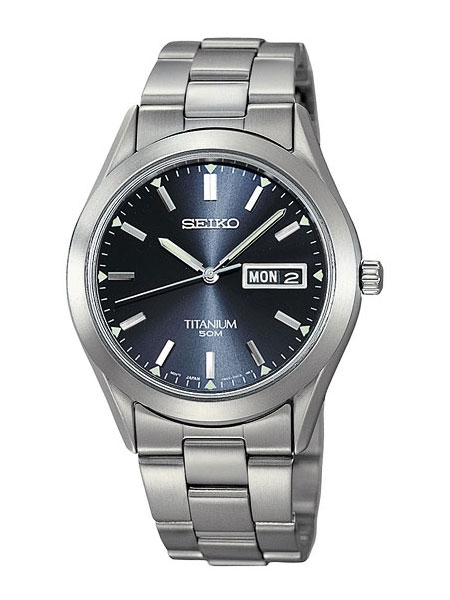 This model has a titanium casing with a smokey grey dial. It’s a sleek watch with an 8mm casing thickness, it’s powered by a quartz movement and has a 50m water resistance rating. You can read my full SKW6007 Skagen watch review here. 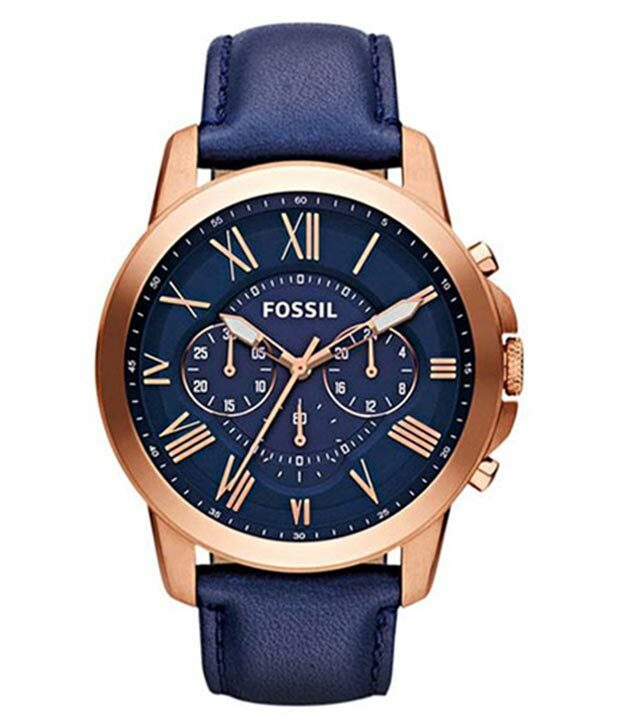 Up next in our list of the best watches under £100 is this Grant Fossil watch which has a beautiful PVD Rose gold plated watch combined with a stunning deep blue dial and genuine leather strap. The dial features a chronograph display with rose gold PVD detailings and lume coating the hands for better visibility in dim lit conditions. 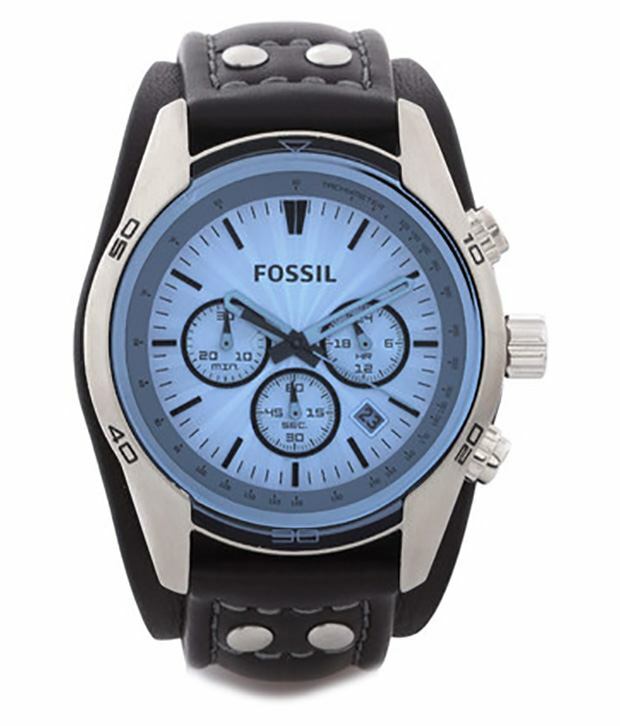 Like many other Fossil watches, this model runs on a Japanese quartz movement and has a 50m water resistance rating. You can read my full FS4835 Fossil Watch review here. This next timepiece is a very cheap watch that’s from a fairly generic brand, yet still nice looking. 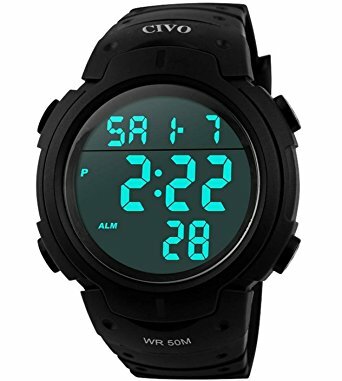 It doesn’t have much in the way of features, but if you’re after a popular cheap watch that will do the job of telling the time and looking nice, then this CIVO might be for you. Ideal for those that aren’t fussed about watch brands. You can read my full CIVO watch review here soon. 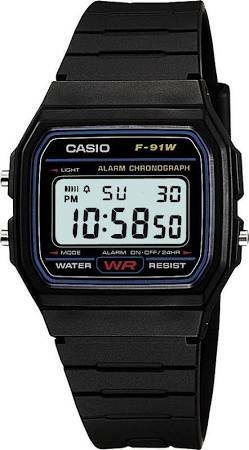 Up next we have another popular cheap men’s watch from Casio’s retro collection. 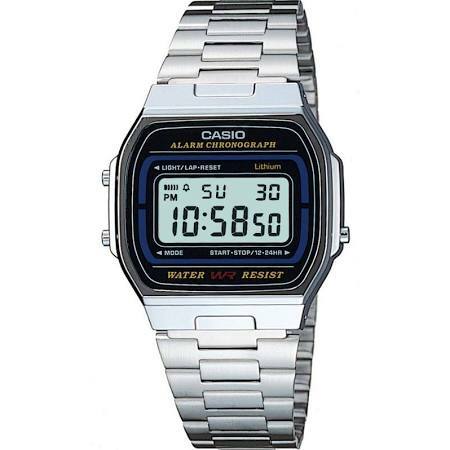 It’s a classic Casio watch with a simple rectangular display. The retro Casio watch features a stopwatch, alarm, chronograph, and backlight function. This is powered by a Japanese quartz movement and has a 50m water resistance rating. You can read my full W-86-1VQES Casio watch review here. 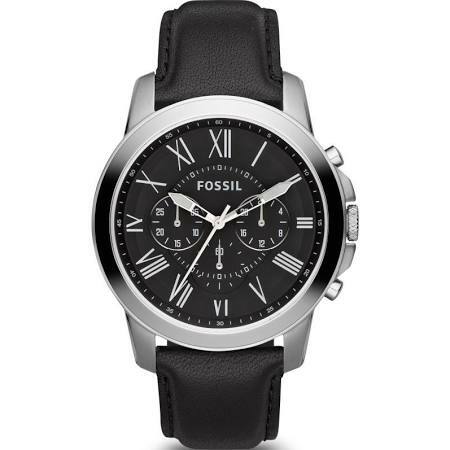 Next up on our list of the best watches under £100 is this popular chronograph Fossil watch. It’s made from stainless steel and features an eye-catching round black dial with golden coloured Roman numeral hour markers. The chronograph watch is powered by quartz movement and has a 50m water resistance rating. You can read my full FS4813 Fossil watch review here. This next affordable digital watch is part of Casio’s G-Shock collection. 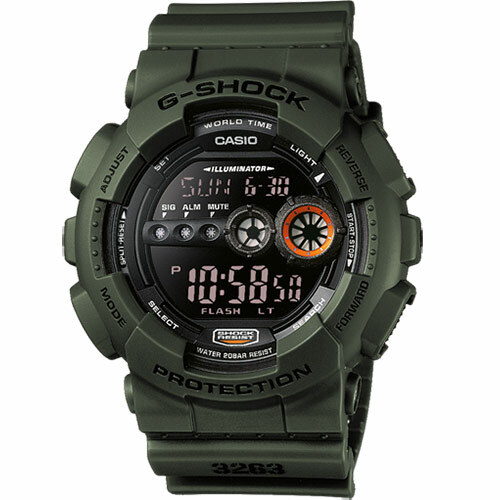 It’s a tough and durable timepiece in an army green colour. The watch features a world time display, stopwatch, countdown timer, 5 alarms, and a 200m water resistance rating. All in all not bad for a watch in this price range. You can read my full Casio G-Shock GD-100MS-3ER review here. 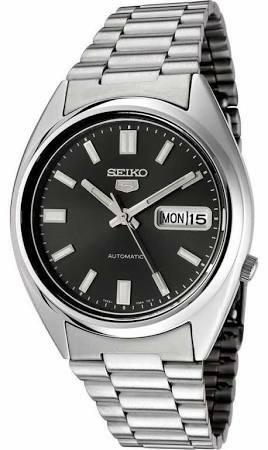 Here we have another popular affordable automatic watch from Seiko’s 5 series. This is another watch that was designed with the idea of building quality affordable automatic watches in mind. As is typical with most of the Seiko 5 watches, it has a smaller 37mm casing diameter with the crown in an off-centered 4 o’clock position. You can read my full SNXS79K Seiko watch review here. Here we have a pretty popular affordable skeleton watch from Alienwork. This watch runs on an automatic movement that’s self-winding, meaning it charges up from the movement of your wrist throughout the day. A nice feature of this watch is the exhibition style caseback that allows you to see the movement at work through the rear of the watch. You can read my full Alienwork watch review here soon. Casio’s Wave Ceptor watches are extremely impressive timepieces. 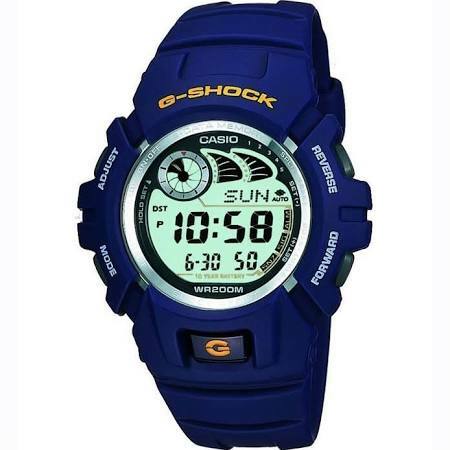 This highly function watch is solar powered using Casio’s Tough Solar technology. It’s also very accurate as it’s controlled and synced up to a radio signal. Extra features include an LED light, NEO-display, world time display, stop watch, 5 daily alarms, automatic calendar, and a 100m water resistance rating. I’d definitely consider this some of the best watch for your money in this price range. You can read my full WVA-M640D-2AER Casio Wave Ceptor watch review here. 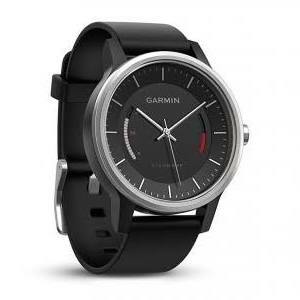 If you’re more into your affordable fitness watches then perhaps this next pick from Garmin would be more up your street. It has a distinctive timeless design that’s easy to use straight out of the box. It displays the time, move bar and steps on the watch face. Plus it can be synced up with Garmin Connect via mobile app or desktop to view stats such as distance, steps and sleep in more detail. You can view my full Garmin Vivomove review here soon. 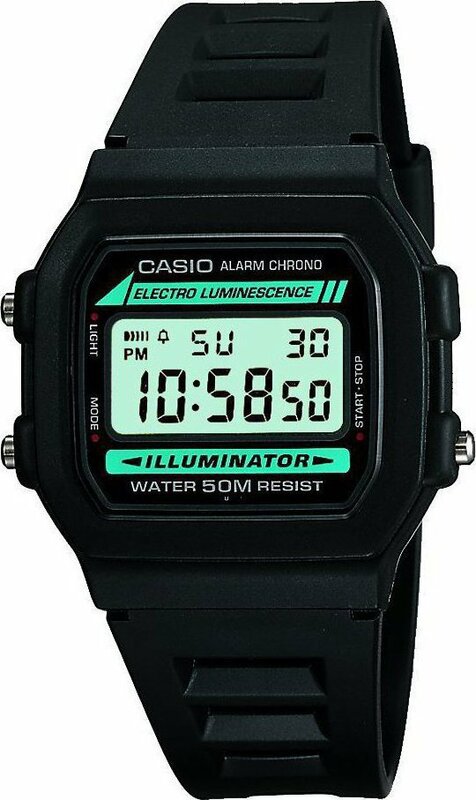 Here we have another affordable Casio retro watch. This digital timepiece has lasted the ages with its classic digital design. This model has a PVD gold plated finish with a LCD dial that has an alarm function, date display and chronograph timekeeping. This is all powered by a Japanese quartz movement that’s both reliable and accurate. You can read my full Casio A159WGEA-1EF review here soon. Next up in our list of the best cheap watches under £100 is this neat little Sekonda 3882, an extremely popular watch for this brand. When it comes to affordable watches, you can’t go wrong with a timepiece like this. It’s very affordable and simply does the job. The dial has a high visibility high contrasting design with lume on the hands and hour markers. 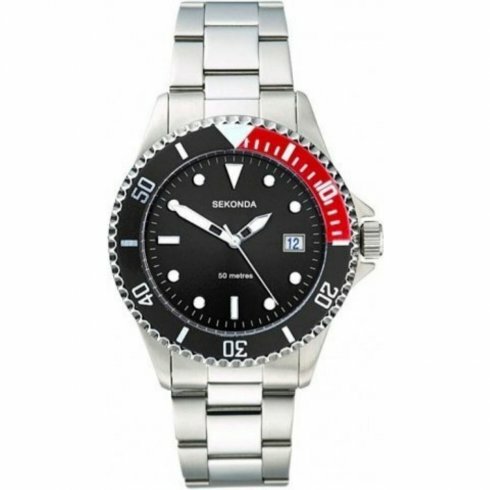 This Sekonda watch also has handy 50m water resistance rating. You can read my full 3882 Sekonda watch review here. Here we have another classic looking smart watch from Festina. 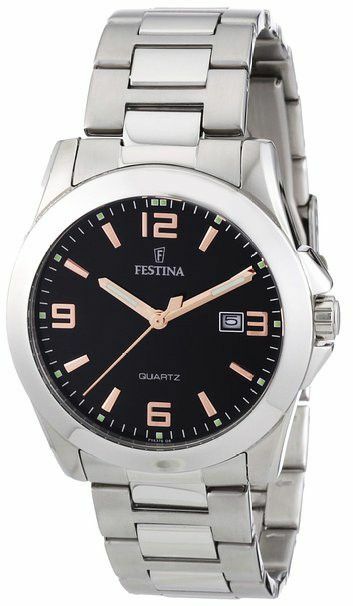 Festina are another brand known for their affordable and mid range watches. This watch is made with a stainless steel round case with a stainless steel bracelet that features a push button clasp. There’s a small date display at the 3 o’clock position, other than this the dial is kept fairly simple with just a hint of lume on the hands. It runs on a quartz movement and has a 50m water resistance rating. You can read my full F16376/6 Festina watch review here soon. Next up in our list of the best watches under £100 is this affordable chronograph timepiece. This wristwatch has a nice large cuff strap design which gives a really sturdy finish. The Coachman features a chronograph dial with white baton hour markers and rose coloured touches. It’s powered by a Japanese quartz movement and has a 100m water resistance rating, the strap is made of a soft genuine leather. You can read my full CH2891 Fossil watch review here. 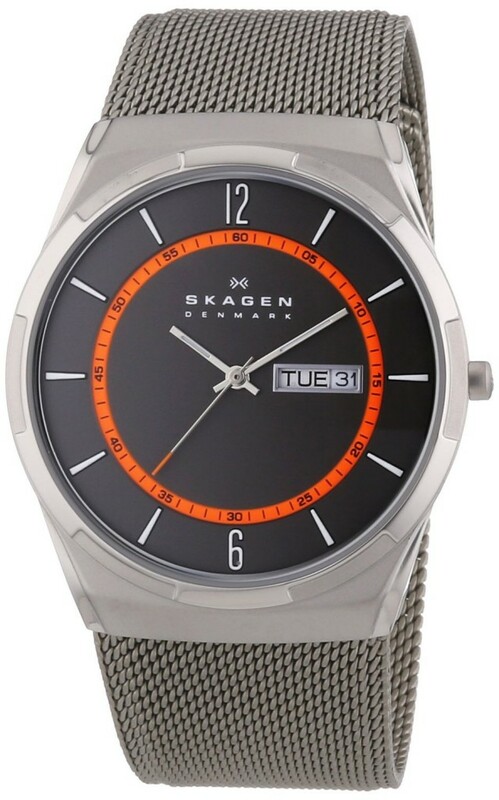 This is another popular affordable titanium watch from Skagen. This sleek looking men’s watch is built with a titanium casing which is lighter and stronger than stainless steel. It’s set around a brilliant blue dial with silver numeral hour markers with a small date display at the 6 o’clock position. This titanium watch is powered by a quartz movement and has a basic 30m water resistance rating. You can read my full 233XLTTN Skagen watch review here. 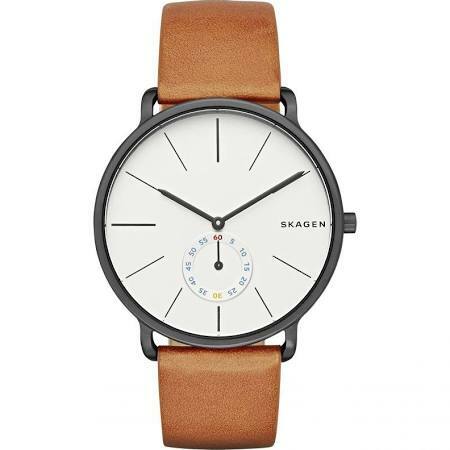 Here we have another stunning watch from Skagen that actually featured in our 100 best minimalist watches for men. It’s a handsome gents watch made with a black ion-plated stainless steel and fitted with an accurate and reliable quartz movement. 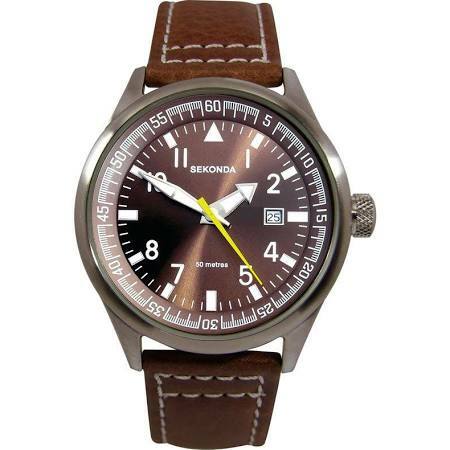 The watch is fastened with a brown genuine leather strap and has a 50m water resistance rating. You can read my full SKW6216 Skagen watch review here soon. 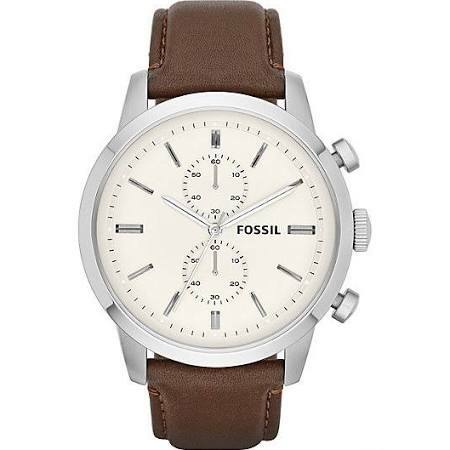 Up next in our list of the best watches under £100 for men is this classic chronograph from Fossil. It’s a smart and stylish timepiece with a nice large 44mm stainless steel casing and genuine leather strap. The Roman numeral hour markers stand out on the cream coloured dial with 3 chronograph sub dials on display in the centre. 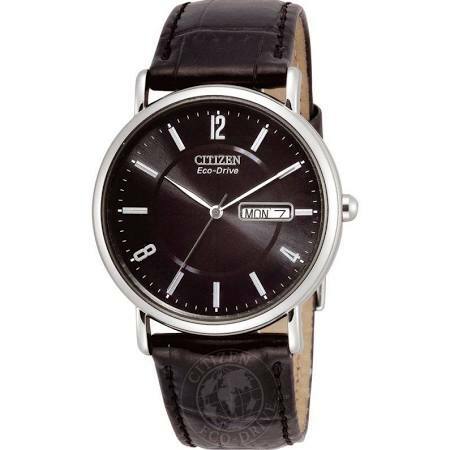 Here we have another popular Citizen watch featuring their Eco-Drive technology. This technology means the watch is powered by light, be it natural or artificial and the watch never requires a battery. These have proved very popular, it’s nice to see this type of watch remaining fairly affordable too. You can read my BM8240-11A Citizen watch review here. 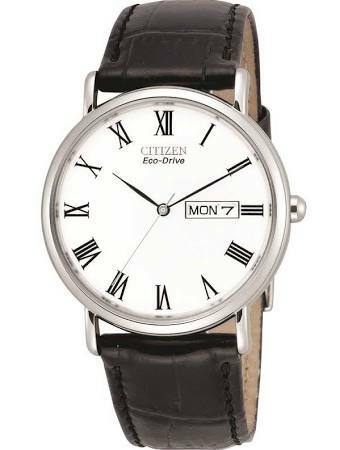 Next up we have another affordable Eco-Drive watch from Citizen. This is a watch that’s powered by light, be it natural or artificial and features a precise quartz movement. It’s a more classic sized watch with a smaller 36mm casing diameter. You can read my full Citizen BM8240-03E review here. When it comes to the best automatic watches under £100, Invicta’s Pro Diver range are a set of watches you should be considering. Now it’s fair to say Invicta has a love hate relationship, but personally, I’m a fan of them. I think these affordable automatic watches that they create offer some pretty decent value for money. This model features a nice easier to read display with lume coating the hands and hour markers for better visibility at night. It runs on a decent automatic self winding movement that can be viewed through the exhibition style caseback. And of course, a key feature is the 200m water resistance rating. You can read my full 8927 Invicta watch review here soon. Here we have another one of the best Invicta watches in my opinion. 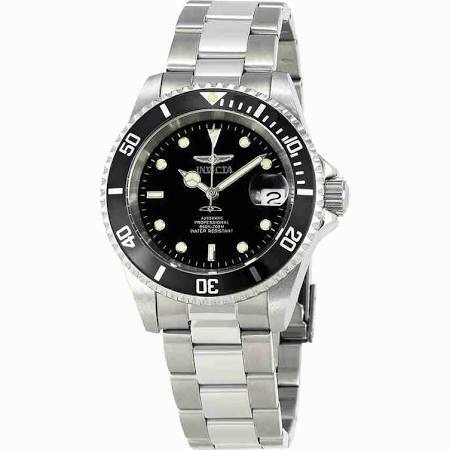 It has a diver’s watch design to it with a large high visibility display and coin edged bezel. The hands and hour markers are coated with a good amount of lume for better visibility in dim lit conditions. Like many of the other Pro Diver watches, this model has a 200m water resistance rating and runs on a reliable automatic movement. You can read my full 8926 Invicta watch review here. 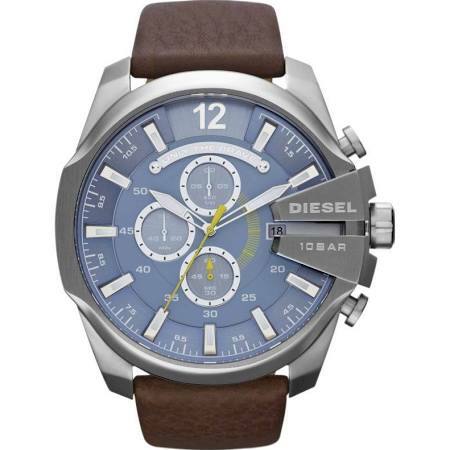 This is a popular oversized chronograph watch from Diesel. This bold Master Chief timepiece has a 52mm casing diameter with a thickness of 14mm, so as you can see, it’s a pretty big watch. The dial has this striking blue colour and features high visibility baton hour markers and hands with 3 sub dial chronograph displays. This affordable chronograph watch from Diesel runs on a Japanese quartz movement and has a 100m water resistance rating. You can read my full DZ4281 Diesel watch review here soon. Here we have another affordable minimalist watch from Skagen. This Denmark brand produces a wide range of minimalist watches that are designed to offer affordable stylish solutions for your wrist wear. The Skagen Ancher is made from a gunmetal PVD and runs on a reliable chronograph quartz movement. You can read my full Skagen SKW6106 watch review here soon. If you’re looking for an affordable Edifice watch then this model from Casio could be just the ticket. As you’d expect from Casio’s Edifice collection, it’s a highly functional timepiece that offers great value for money in my opinion. The watch has a dual digital and analogue display and features a accurate quartz movement as well as a 100m water resistance rating. You can read my full Casio Edifice EFA-121D-1AVEF watch review here soon. 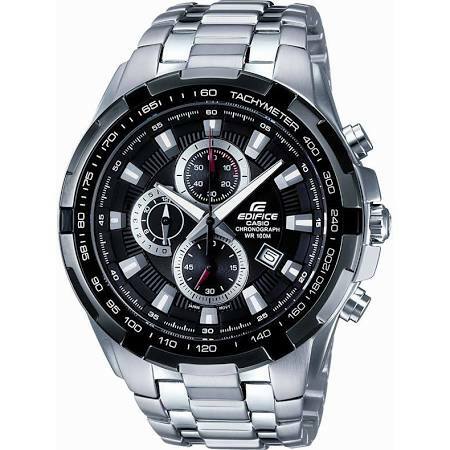 Here we have another stylish Casio Edifice Chronograph watch that’s built with a solid stainless steel casing that measures 49mm in diameter, making it a fairly large watch. The watch features a clear chronograph display with lume coating on the hands and hour markers for better visibility in dim lit conditions. 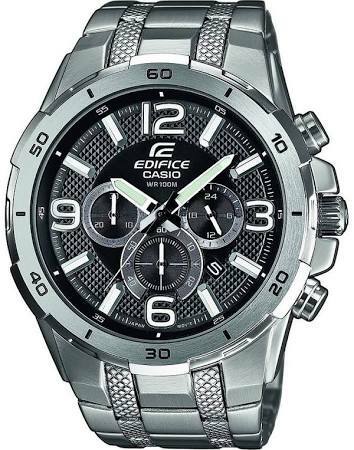 This affordable Edifice watch runs on a reliable quartz movement and has a 100m water resistance rating. You can read my full EF-539D-1AVEF Casio Edifice watch review here. I mentioned earlier on we’d be seeing a couple of colour variations from Seiko’s SNK range. This model features a beautiful clear green dial matched up with a green coloured fabric strap. This affordable automatic watch from Seiko’s 5 collection runs on a 21 jewel automatic movement and features an exhibition-style caseback so you can view the movement at work through the rear of the watch. You can read my full SNK805 Seiko 5 watch review here. 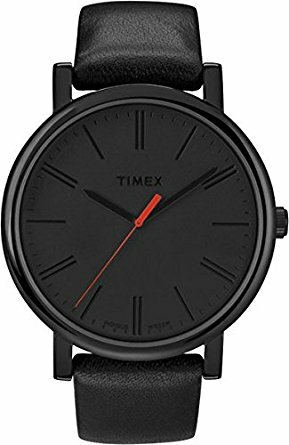 Timex are another popular affordable watch brand that’s often a go to choice for those out there looking for cheap watches. 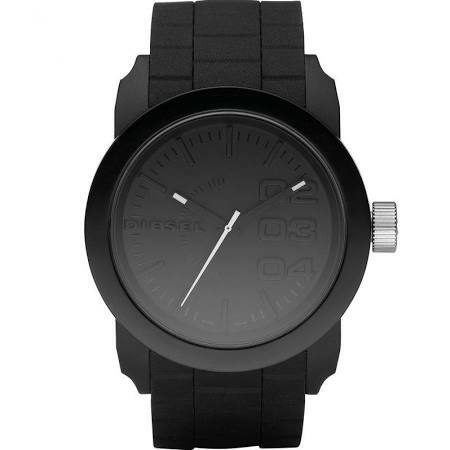 This is an affordable minimalist watch with an all black design. The dial features slender baton hour markers and an Indiglo backlight for better visibility in dim lit conditions. You can read my full T2N794 Timex watch review here soon. 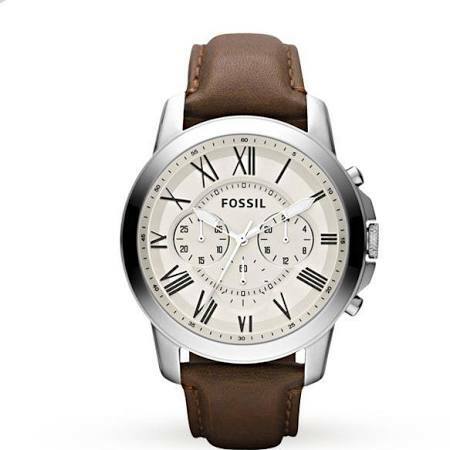 Another popular watch from Fossil is the CH2564 Coachman. This is a cuff style watch with a large genuine leather strap with this wider cuff finish around the casing. It’s a fairly affordable chronograph watch that features a sports style pale silver dial and runs on a Japanese quartz movement. You can read my full CH2564 Fossil review here soon. 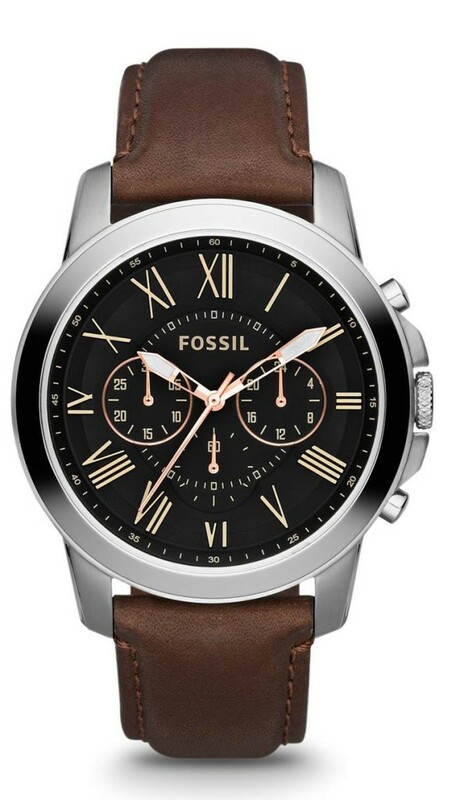 Fossil are another popular affordable watch brand known for their quality watches with a huge range available in a variety of styles and designs. This is an affordable chronograph watch from their Grant collection. It’s a stylish watch that would be suitable for both smart or casual occasions in my opinion. It runs on a Japanese quartz movement and has a 50m water resistance rating. You can read my full FS4812 Fossil watch review here soon. 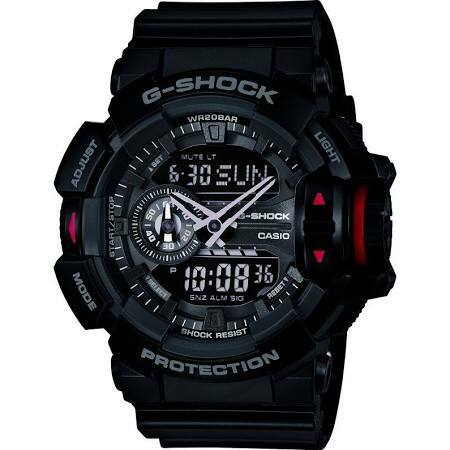 Here we have a popular affordable G-Shock watch from Casio. It’s an extra tough and durable chronograph timepiece that features a multi alarm, multi time zone, stopwatch, and countdown timer. The thick resin the surrounds the casing gives it this extra protection from drops and vibration. The watch features a dual display and also has a 200m water resistance rating. You can read my full GA-110-1BER G-Shock watch review here. This next watch is perfect for those of you looking for a cheap Seiko watch that’s built to a high quality finish and offers great value for money. This is an affordable automatic Seiko 5 watch that runs on a Japanese 21 jewel automatic movement and has a basic 30m water resistance rating. The Seiko 7S26 automatic movement is well favoured and known to be a bit of a workhorse, you can view the movement at work through the exhibition style caseback. You can read my full Seiko SNXS77 review here. Next up we have another stunning affordable Invicta watch with this beautiful gold PVD plated finish. This is another timepiece from the Pro Diver collection that runs on a reliable automatic self winding movement that can be seen through the exhibition caseback on the watch. The dial features easy to read hands and hour markers that have a generous coating of lume for better visibility in dim lit conditions. You can read my full Invicta 8929OB review here soon. Here we have another highly functional affordable watch from Casio’s Edifice collection. 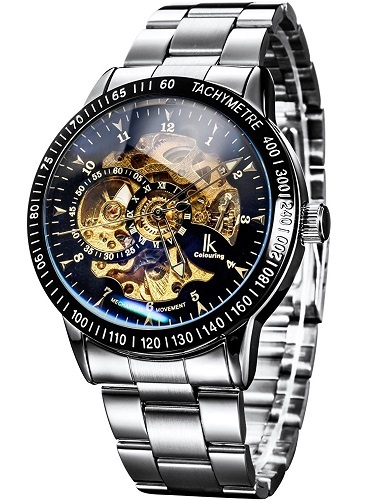 This is a stylish men’s watch in stainless steel that runs on a accurate and reliable Japanese made quartz movement. It’s a larger watch with a 49mm casing diameter and a thickness of 14mm. Extra functions of this watch include an auto calendar, date display, neobrite technology, stopwatch and a world time display. 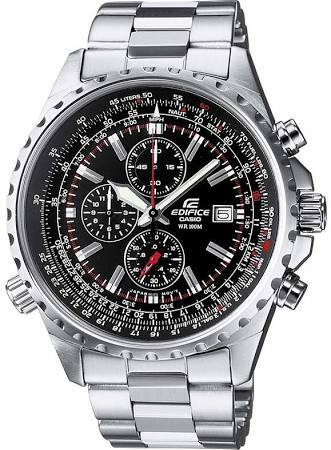 As for the water resistance, it’s like many other Edifice watches and has a 100m rating. You can read my full EF-558D-1AVEF Casio Edifice review here soon. Next up on our list of the best watches under £100 is this Timex Expedition. 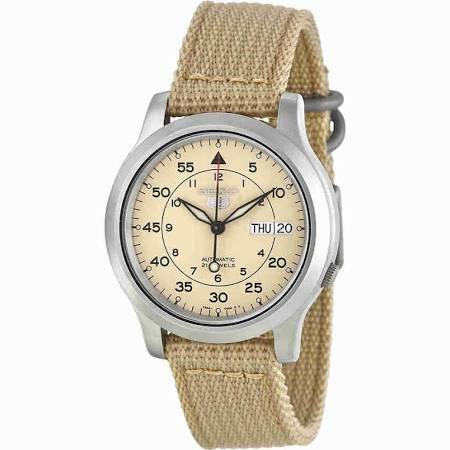 This is a handsome looking military field watch that features Timex’s extremely popular Indiglo technology for excellent visibility in dim lit conditions. 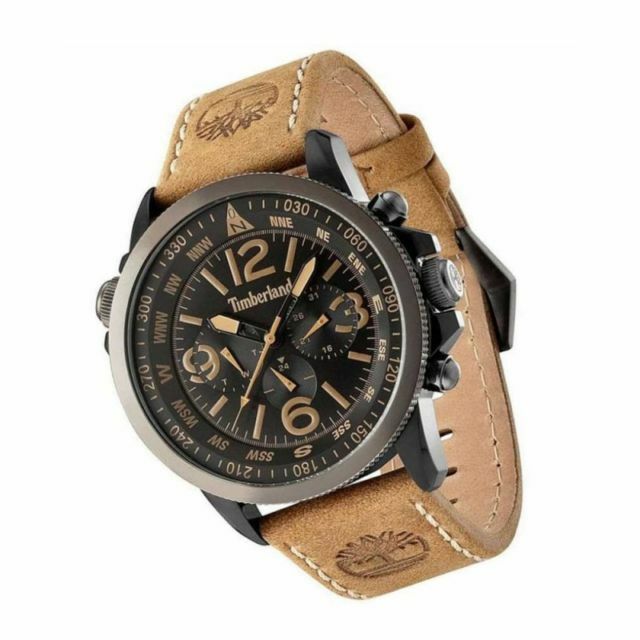 It fastens with a khaki fabric strap, runs on a quartz movement and has a 50m water resistance rating. You can read my full T49961 Timex watch review here soon. 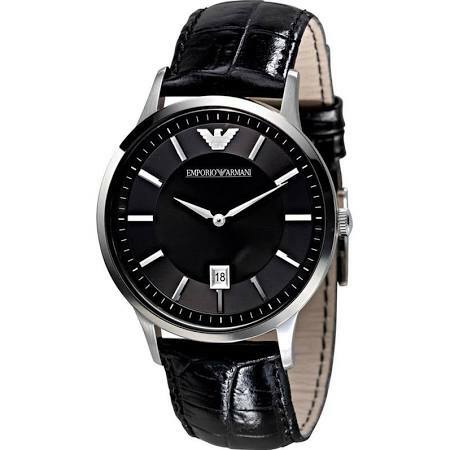 If you’re after an affordable Emporio Armani watch then this sleek looking stylish model is worth considering. It runs on a Japanese quartz movement and has a 50m water resistance rating. It’s ideal for both casual and smart occasions with its minimal design and slim 8mm casing. 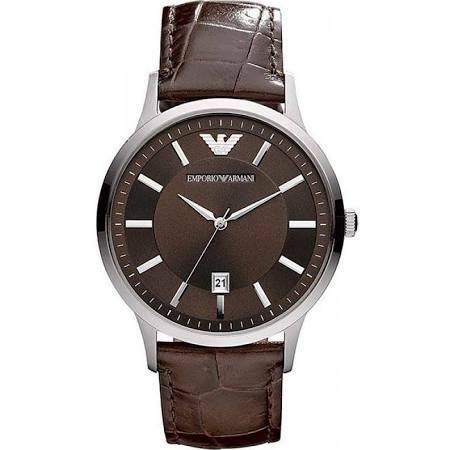 You can read my full AR2411 Emporio Armani watch review here. 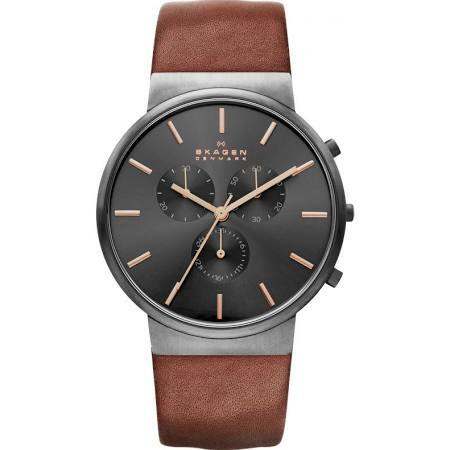 Here we have another affordable minimalist watch by Skagen. 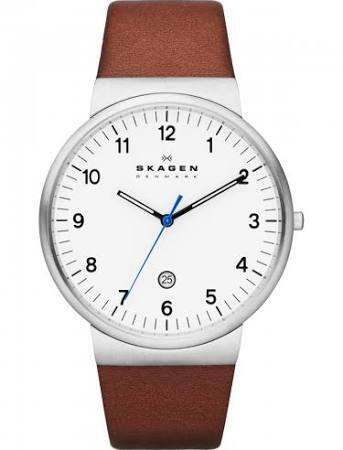 The Skagen Ancher Relaxed is powered by a quartz movement and fastens with a soft brown genuine leather strap. It’s a slim watch with a 7mm casing depth which is often an important feature in minimalist watches. You can read my full Skagen SKW6082 watch review here soon. 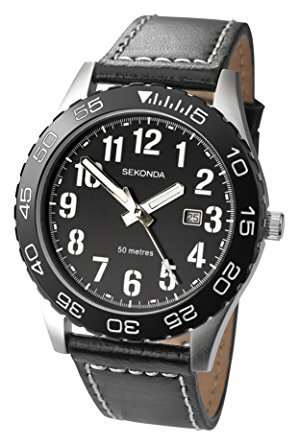 Sekonda are another popular brand for cheap watches. 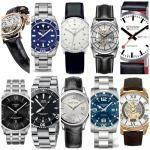 They are one of the biggest selling watch brands in the UK with a focus on high quality attractive looking watches that offer great value for money. This model features a high-visibility dial with bold hands and hour markers as well as 3 chronograph sub dials. You can read my full 105827 Sekonda watch review here. 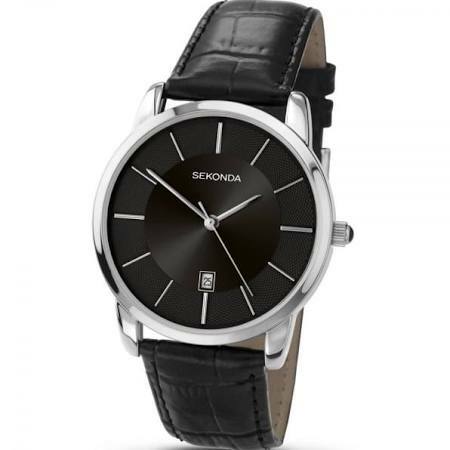 Here we have another popular timepiece from the affordable watch brand Sekonda. This is a nice high visibility analogue display watch with large bold numerals and watch hands. There’s a small date display at the 3 o’clock position and the watch has a 50m water resistance rating. You can read my full 1130 Sekonda watch review here soon. 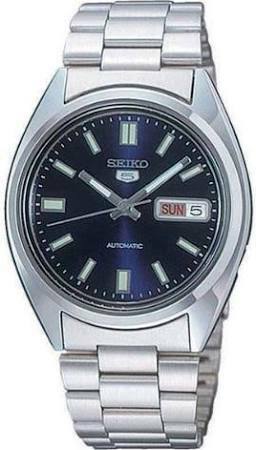 This is another popular affordable automatic watch from Seiko’s 5 collection. It’s a high-shine stainless steel watch with an off white dial and slim hands and hour markers. This affordable Seiko watch is powered by a self-winding automatic movement and has a 30m water resistance rating. You can read my full SNXG47K1 Seiko watch review here soon. Up next is another awesome watch from Casio’s Edifice collection. This is a sports watch that’s still ideal for business of casual occasions. It features a stopwatch, luminous hands and luminous numerals. It’s a large watch with a 46mm casing diameter and 14mm thickness. It also has a 100m water resistance rating which is handy to have. You can read my full EFR-538D-1AVUEF Casio Edifice watch review here. This is an affordable titanium watch from Skagen. It features their popular minimalist design on a titanium casing which is lighter and stronger than stainless steel. The strap is made of stainless steel and is in a mesh style finish. This timepiece has a 50m water resistance rating and runs on a reliable quartz movement. You can read my full Skagen SKW6078 watch review here soon. 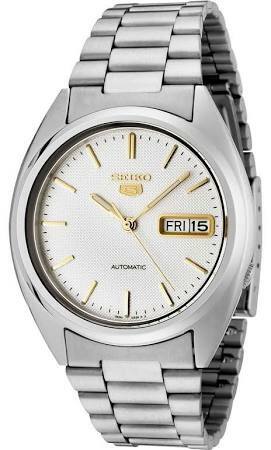 This is another popular affordable automatic watch from Seiko’s 5 series. It’s a variant of the SNK collection which features the exhibition casebacks allowing you to view the self winding automatic movement at work. 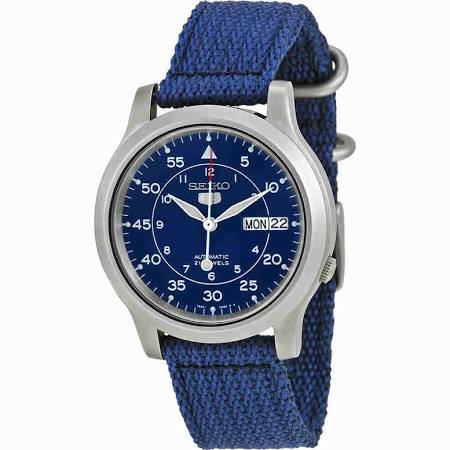 This model has a brilliant blue dial coupled with a blue nylon fabric strap. You can read my full Seiko SNK807 review here. This next watch features in our 5 most popular Casio Edifice watches for 2016. 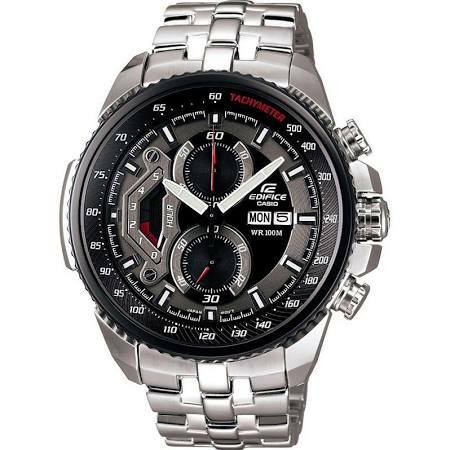 It’s a top selling watch from Casio’s Edifice collection of high performance watches. The watch features Neobrite illumination coating on the hands to make them extra visible in dim lit conditions. The dial features both a chronograph and tachymeter display. It has a 100m water resistance rating too. You can read my full EF-527D-1AVEF Casio Edifice watch review here soon. 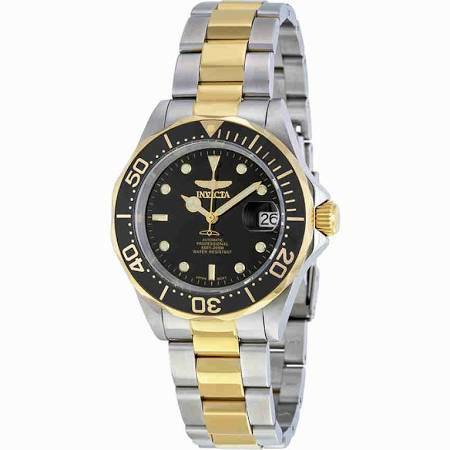 This is another one of Invicta’s popular oversized Pro Diver watches. This model actually runs on a Swiss made quartz movement instead of the automatic movements featured in the previous watches. The dial features these bold dot style hour markers as well as a date display with a magnifier window. 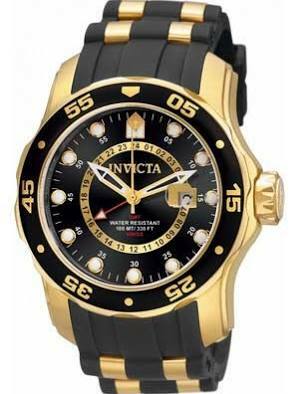 This Pro Diver watch from Invicta has a 100m water resistance rating. You can read my full Invicta 6991 watch review here. Up next in our list of the best watches under £100 is this popular G-Shock timepiece from Casio. 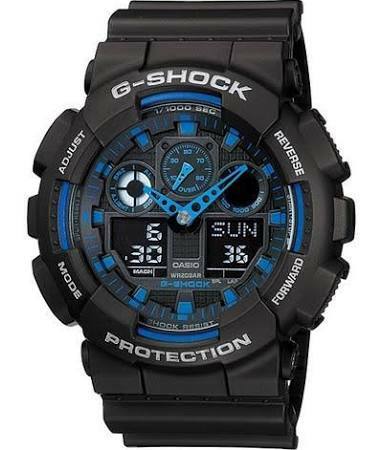 This is one of the most affordable G-Shock watches available and comes in this deep blue colour. It’s the perfect combination of value for money and functionality. It has a shock resistant built and functions include world time display, alarm, countdown timer, stopwatch, and a 200m water resistance rating. You can read my full G-2900F-2VER G-Shock watch review here. 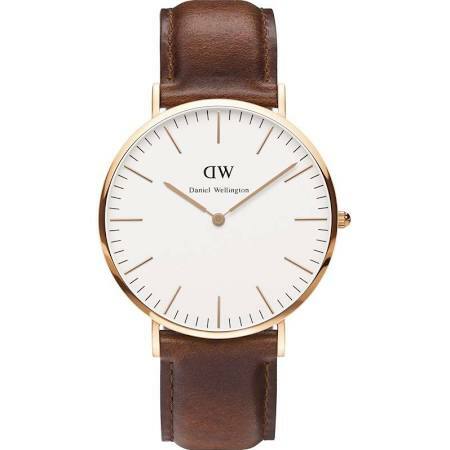 Here we have another popular minimalist watch from Daniel Wellington. This affordable minimalistic watch has a slim-line 6mm casing and is powered by a reliable quartz movement. It’s fitted with a multicolour fabric strap and has a beautiful large white dial. You can read my full 0204DW Daniel Wellington watch review here. 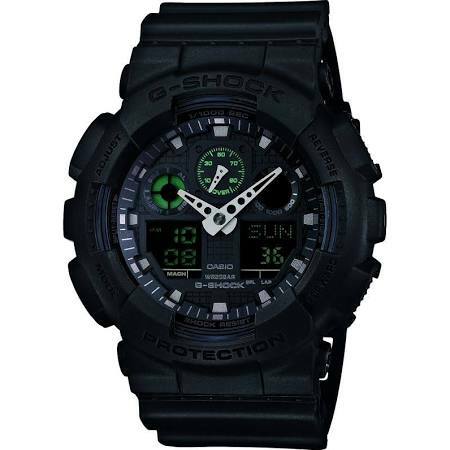 This is another popular oversized watch from Casio’s G-Shock collection. It’s a military style watch with a large 50mm diameter that comes from this thick protective resin that surrounds the stainless steel casing. It has a dual digital analogue display and runs on a chronograph quartz movement. As is common with many of the G-Shock watches it also has a 200m water resistance rating. You can read my full GA-100MB-1AER Casio G-Shock watch review here. This is a smart looking gents Armani Exchange watch with an analogue chronograph quartz movement and basic 30m water resistance rating. The movement is Japanese made and offers reliable accurate timekeeping. 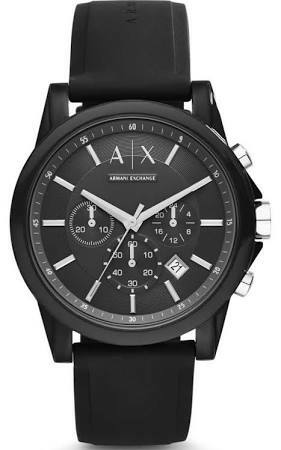 You can read my full AX1326 Armani Exchange watch review here soon. 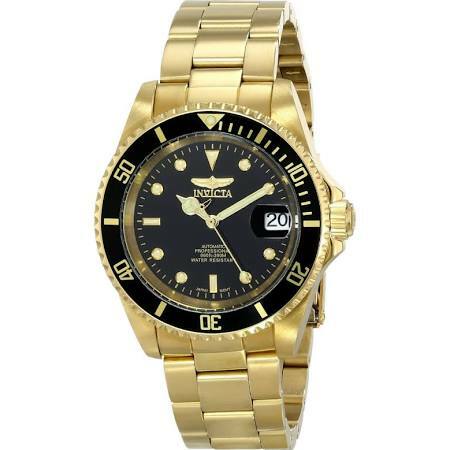 Next up in our list of the best watches under £100 for men is this popular Invicta Pro Diver edition. The watch features this fantastic blue bezel which matches up with the deep blue dial nicely. As you’d expect from a diving style watch it has a high visibility display with lume coating the hands and hour markers. It also features a uni-directional rotating bezel and a 200m water resistance rating. You can read my full Invicta 9204 watch review here. 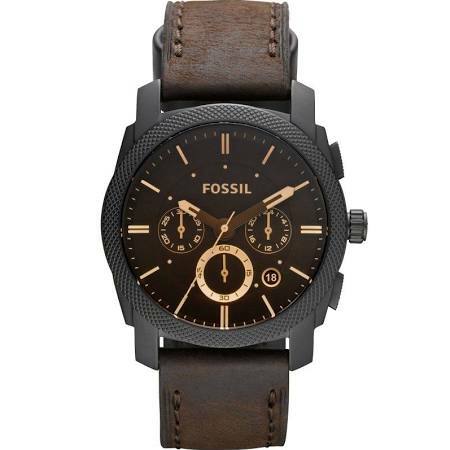 This is another attractive looking timepiece from Fossil. It’s an oversized chronograph watch from their Nate collection. It’s made with a black ion-plated steel and features this large black dial. It’s powered by a Japanese quartz movement and has a 50m water resistance rating. You can read my full JR1401 Fossil watch review here. 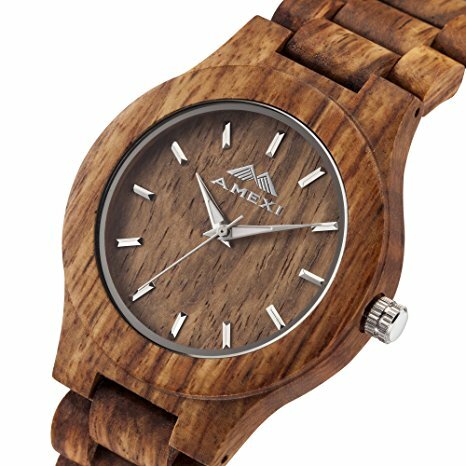 Another great option for people looking for cheap watches is this wooden timepiece from Amexi. It’s finished in a Rosewood casing with matching strap and runs on a reliable and accurate Japanese quartz movement. There’s a few variations of this available so if you like the idea of it but perhaps want another type of wood, you should have a little browse on the related items to this one. You can read my full Amexi wooden watches review here soon. 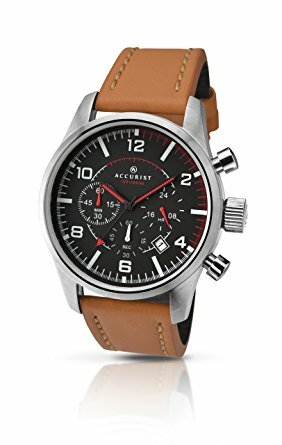 Accurist are another brilliant affordable watch brand that has a huge range of watches under £100 available in a variety of styles and designs. This model features a nice large chronograph display on a black dial with red accents. It’s powered by a reliable quartz movement and has a 100m water resistance rating. Overall, pretty good value for money in my opinion. You can read my full 7022.01 Accurist watch review here soon. 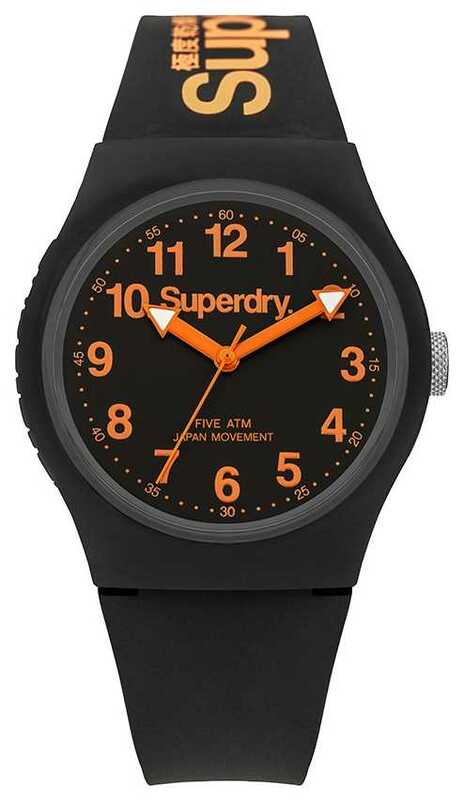 This is a Superdry Urban watch that’s made from a plastic/resin mix. It’s powered by a Japanese quartz movement and has a basic water resistance rating. Superdry is another one of those affordable watch brands that you’ll spot a lot of teenagers going for as they offer a variety of stylish watch designs. You can read my full SYG164B Superdry watch review here soon. Here we have an affordable Kinetic watch from Pulsar. This Kinetic movement is a Seiko technology that puts the benefits of an automatic and quartz movement together. The watch is very accurate and is charged up by the movement of the wearer’s wrist. 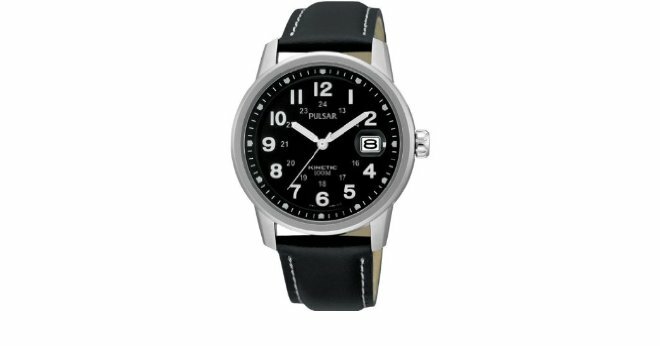 This model appeared in my 15 best Pulsar watches for men. You can read my full PAR087X1 Pulsar watch review here soon. Next up is another brilliant cheap watch from Timex, a popular affordable watch brand. 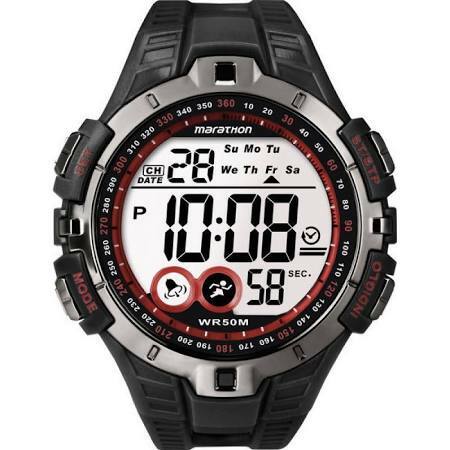 This sports style timepiece is the Timex Marathon in black. 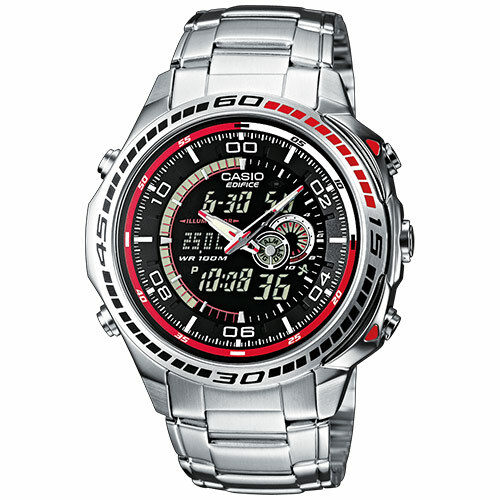 It features a high visibility digital display with chronograph features and a daily alarm. It also features Timex’s Indiglo nightlight technology for excellent visibility in dim lit conditions. You can read my full Timex Marathon Watch Review here soon. 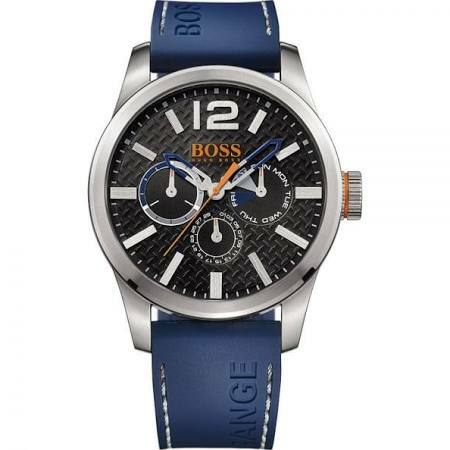 This is a large men’s 47mm watch from the Hugo Boss Orange Paris collection. It features a nice large chronograph display that’s powered by a reliable Japanese quartz movement. It fastens with a comfortable blue silicone rubber strap and has a basic 30m water resistance rating. You can read my full 1513250 Hugo Boss watch review here soon. Next up in our list of the best watches under £100 is this popular stuhrling timepiece that features in our are Stuhrling watches good? watch review. This is a popular diving style watch with a 200m water resistance rating and a high visibility dial with lume coating the hands and hour markers. You can check out more of the best diving watches here. 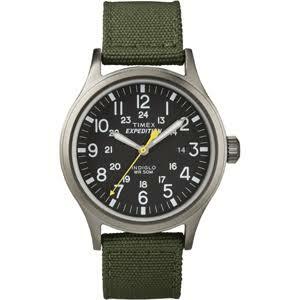 Here we have another popular cheap watch from Timex. This model is designed to have a large extra visible dial with large numerals and high contrasting hands to make it easier to read. There’s a small date display found at the 3 o’clock position which can also come in handy. A key feature of this watch is the Timex Indiglo technology that lights up the watch so that it can be read in dim lit conditions. You can read my full Timex Indiglo watch review here soon. I’ve actually got this next affordable Armani watch in my personal collection. It has such a comfortable genuine leather strap, this is something I was really impressed with. It’s a classic design that’s suitable for both smart and casual occasions in my opinion. It’s powered by a Japanese quartz movement and has a 50m water resistance rating. You can read my full AR2413 Armani watches review here soon. This affordable Swatch watch is next up in our list of the best watches under £100 for men. It’s a minimalist watch that once again proves that simple is still effective. The monochrome watch is powered by a reliable Swiss quartz movement and features a day and date display on the dial. You can read my full GB743 Swatch watch review here. 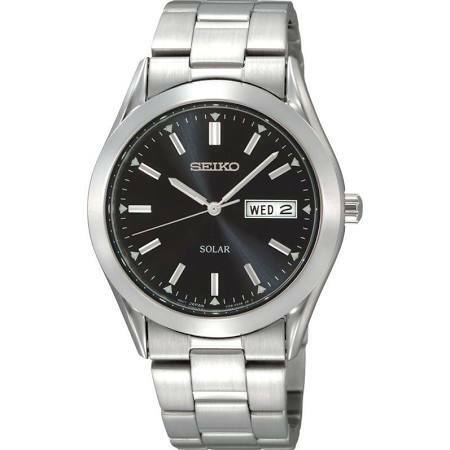 Here we have another popular affordable Solar watch from Seiko. 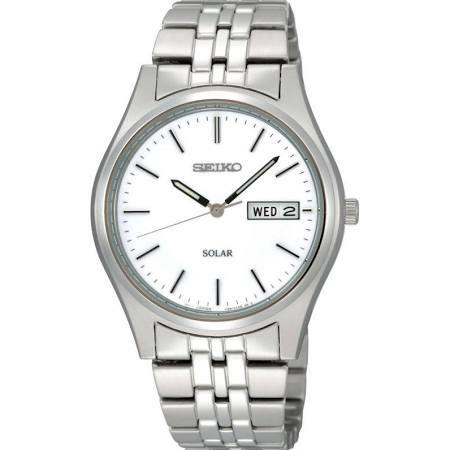 This men’s Seiko solar watch is powered by light, be it natural or artificial. It has a simple classic dial with lume coated hands and hour markers for better visibility in dim lit conditions. There’s also a handy day and date display at the 3 o’clock position on the dial. This watch features in our 7 best Seiko Solar watches for men. 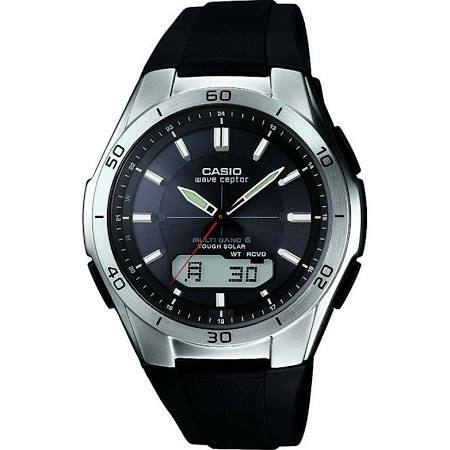 This is a popular affordable Casio Wave Ceptor watch. It’s a solar powered and radio controlled combination watch that offers fantastic value for money. If you’re looking for a high performance ultra accurate timepiece, then radio-controlled is always worth considering. The watch also has a dual digital display and has a 100m water resistance rating. You can read my full WVA-M640-1AER Casio Wave Ceptor review here. This is the last Seiko 5 watch we’re featuring from the SNK collection. It’s a colour variant of the previous models showed, this time with a beige dial and nylon fabric strap. It features a 21 jewel automatic movement that’s favoured for this type of watch. A great feature that the watch also has is the exhibition style caseback allowing you to view the movement working away. You can view my full Seiko 5 SNK803 watch review here. 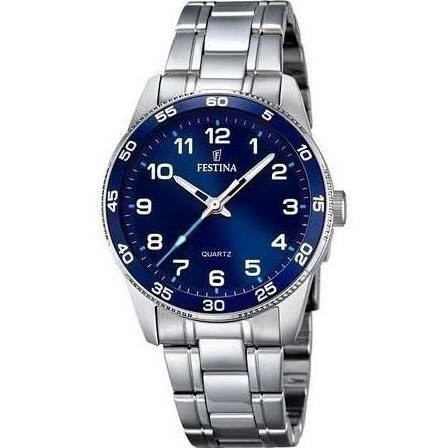 Next up in our list of the best watches under £100 is this classic timepiece from Festina. It’s designed as a unisex watch that’s also suitable for children with its smaller 34mm casing diameter. This is a small watch so if you prefer larger timepieces, definitely don’t go for it. The watch features a nice lume coated display and runs on a quartz style movement with a 50m water resistance rating. You can read my full F16905/2 Festina watch review here soon. 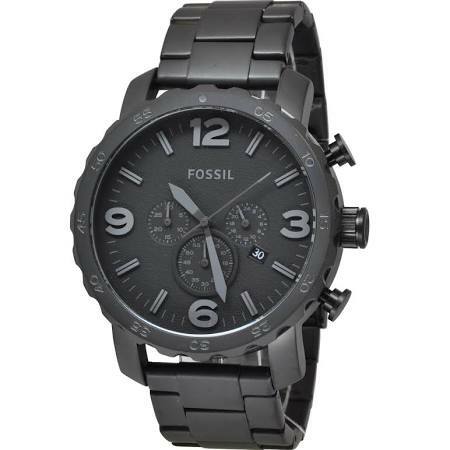 This is another popular affordable chronograph watch from the Fossil Grant collection. It’s built with a stainless steel blue ion plated casing and is fitted with a reliable Japanese quartz chronograph movement. The comfortable genuine leather strap fastens with a buckle style clasp. You can read my full Fossil FS5151 watch review here soon. Timex produces some of the best affordable watches in my opinion. 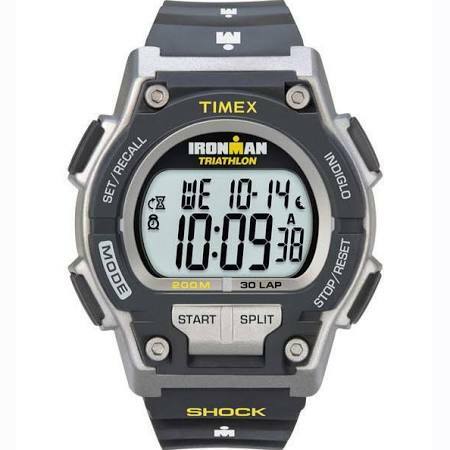 The Timex Ironman is a tough watch that’s designed for Triathlons. It has a sporty high tech look with a high visibility LCD display. Its features include chronograph, alarm, day and month functions, a sturdy rubber strap, and a 200m water resistance rating. This model featured in our best digital watches for men. You can read my full Timex Ironman watch review here soon. 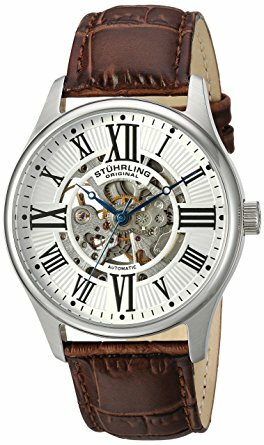 Here we have another popular Stuhrling watch that features this stunning skeleton dial design. The automatic self-winding movement can be viewed through the front or rear of the watch via the exhibition style caseback. The dial is protected by a Krystyna crystal glass which offers a good level of resistance to scratches and knocks. 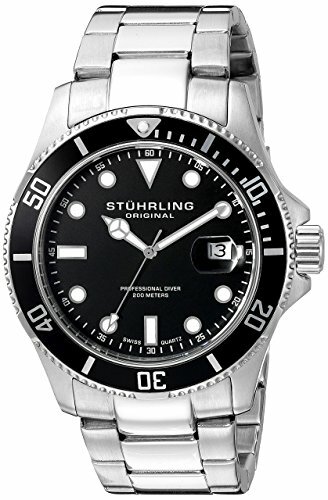 This automatic watch from Stuhrling has a 50m water resistance rating. You can read my full 747.01 Stuhrling watch review here soon. 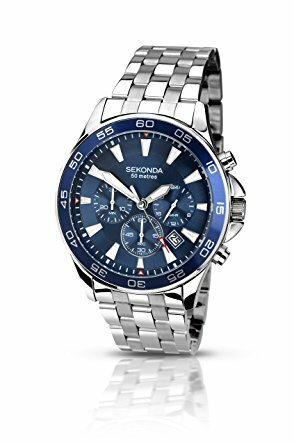 Here we have another popular cheap men’s watch from the affordable watch brand Sekonda. 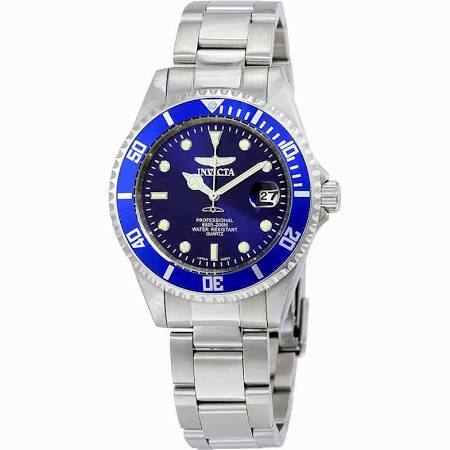 It features a popular diving design with a Pepsi style coin edged bezel. It’s a decent affordable watch running on a Japanese quartz movement with a 50m water resistance rating. You can read my full Sekonda 3078 watch review here. This Sekonda timepiece features in our best watches under £50 for men. It’s a neat classic watch with a clear minimal display. This simple watch is powered by a quartz movement and has a basic water resistance rating. You can view more cheap men’s watches like this one here. Bulova are one of my favourite affordable watch brands, I’ve got a few of their timepieces in my personal collection, they’re a brand I’ve always been quite happy with. this model has a high visibility chronograph display and runs on a reliable quartz Japanese Miyota movement. 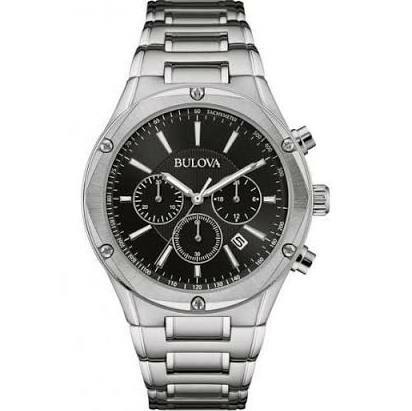 You can view my full 96B247 Bulova watch review here. 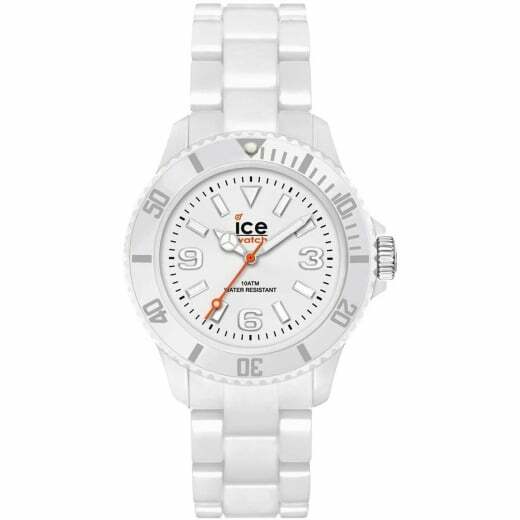 This is a solid white watch from ICE, a little different than their normal collection of vibrant colourful watches. This model has just the touch of colour in the form of an orange seconds hand. If you’re looking for the coolest watches for summer, ICE are a brand worth considering with their fun collection. This ICE watch runs on a Japanese quartz movement and has an impressive 100m water resistance rating. You can view more of the colourful ICE watches here. 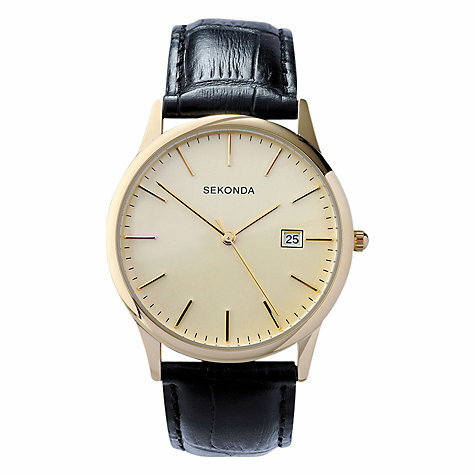 This is another popular cheap watch from Sekonda. It’s a classic vintage style watch that runs on a reliable and accurate quartz movement. As you’d expect from a vintage style watch it has a smaller 36mm casing diameter with a slim 8mm casing depth. This watch also featured in our best watches under £50. This is the last Fossil watch featuring in our list of the best affordable watches for men. 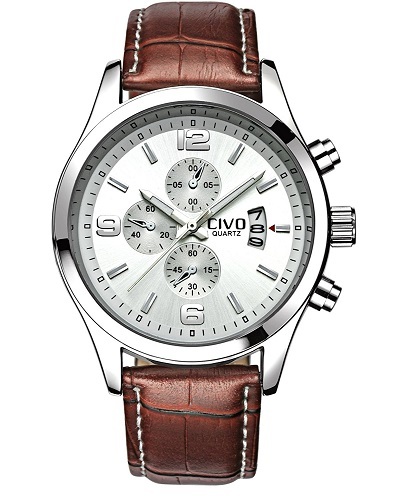 It’s a popular chronograph timepiece with an off white dial and genuine leather brown strap. It features a larger 48mm casing diameter which has proven popular for men’s watches lately. This Fossil watch runs on a quartz movement and has a 50m water resistance rating. 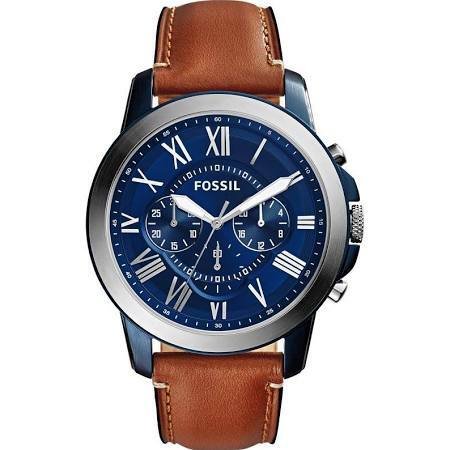 This model also featured in our best Fossil watches for men. Here we have another beautiful understand Seiko solar watch that’s powered by natural and artificial light. It has a simple white dial with slim baton style hour markers and a day and date display at the 3 o’clock position. You can read my full SNE031P1 Seiko Solar watch review here soon. 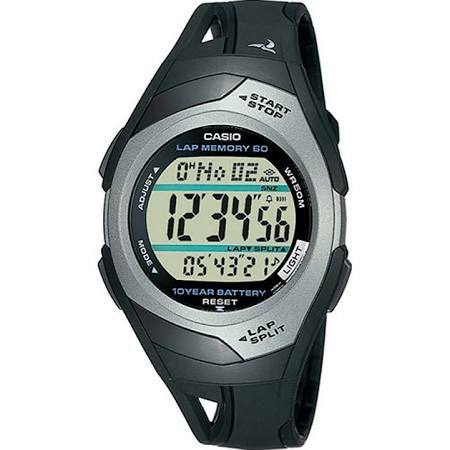 Here we have a multi function cheap digital watch from Casio. It’s a great budget watch with a clear digital LCD display with a backlight function. Extra features include a 60 lap stopwatch function, dual time display, alarm, and a 50m water resistance rating. Not bad for an affordable digital watch in my opinion. You can read my full STR-300C-1VER Casio digital watch review here soon. Seiko has produced this brilliant affordable titanium watch that runs on a reliable Japanese quartz movement. Both the casing and the strap are made of titanium, it’s both larger and stronger than stainless steel making it a great material to work with. The dial has a simple design with lume coating the hands for better visibility in dim lit conditions. There’s also a useful day and date display at the 3 o’clock position. You can view my full SGG709 Seiko titanium watch review here soon. Here we have the last cheap watch from Sekonda to feature in our list of the best watches under £100. 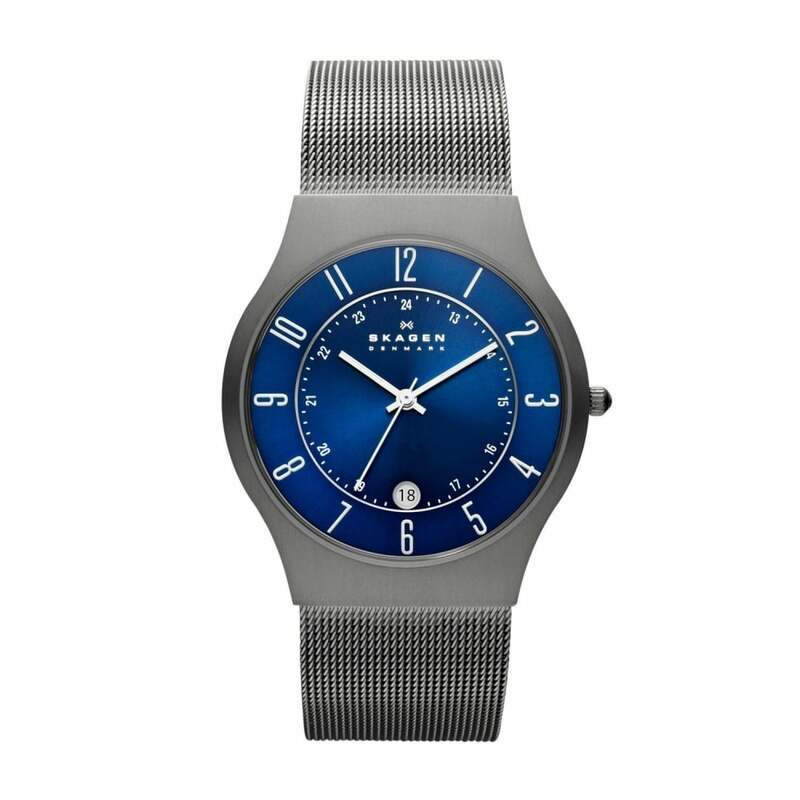 It’s a simple watch with a cool blue dial and a stainless steel mesh style bracelet strap. It runs on a reliable and accurate quartz movement and has a basic water resistance rating. You can read my full 1065.27 Sekonda watch review here soon. 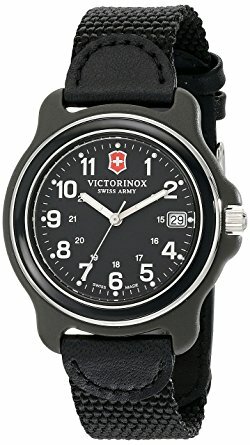 If you’re looking for cheap Swiss watches then brands like Swiss Military Hanowa and Victorinox are both well worth looking into. This watch runs on a Swiss made quartz movement for excellent precision and has a sapphire crystal glass for brilliant scratch protection. It also has a useful 50m water resistance rating. 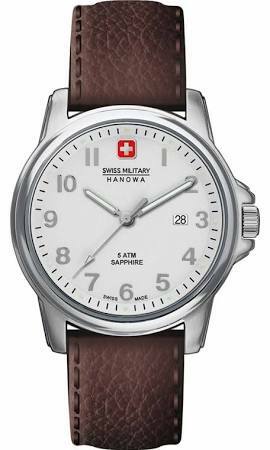 You can read my full 6-4231.04.001 Swiss Military Hanowa watch review here. Victorinox are another great brand for affordable Swiss made watches. This model features a classic military watch design with a high visibility contrasting dial design and a durable nylon strap. It’s water resistant to 100m and is powered by a Swiss quartz movement for excellent reliability and accuracy. You can read my full 249090 Victroinox Swiss Military watch review here soon. This men’s Timberland Campton watch has a black ion-plated stainless steel casing and is fitted with a quartz movement for reliable timekeeping. 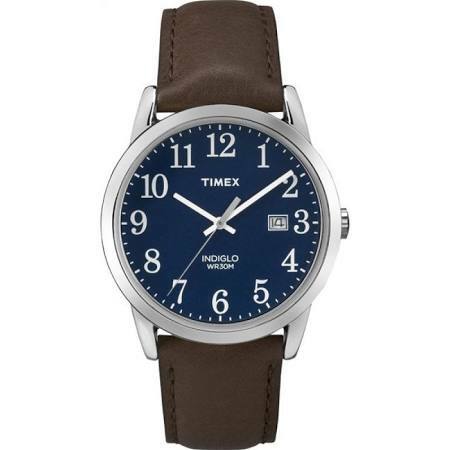 It also features a comfortable genuine leather strap in brown that has a cream stitching. It’s a larger watch with a 46mm casing diameter and a thickness of 11mm. You can read my full 13910JSBU/02 Timberland watch review here soon. This is a slick looking affordable men’s watch from Diesel. It’s designed in all black and made with a plastic, resin and stainless steel. It’s ideal for our list of the best watches under £100 as it’s a best selling watch from a well-known designer brand. It’s powered by a Japanese quartz movement and has a 50m water resistance rating. You can read my full DZ1437 Diesel watch review here soon. Lorus are another popular affordable watch brand and rightly so should feature in our list of the best watches under £100. This popular watch has a titanium casing that’s lighter and stronger than stainless steel. It’s a casual men’s watch with a cream dial that has bold numeral hour markers and high-vis hands. The watch fastens with a comfortable Khaki strap and is powered by a quality quartz movement. 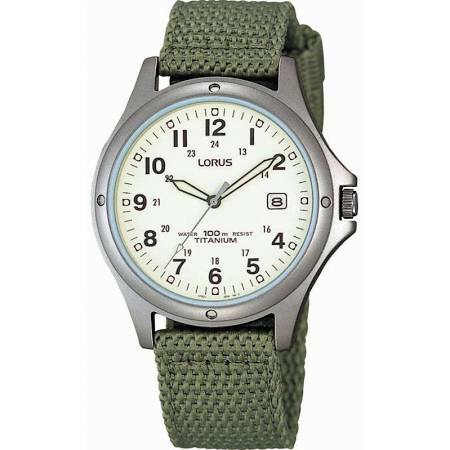 Another great feature of this affordable Lorus watch is the 100m water resistance rating. You can read my full RXD425L8 Lorus watch review here soon. The last timepiece to feature in our list of the best watches under £100 is this popular sleek Rotary with a mesh style bracelet strap. I’m quite a fan of these mesh straps, I find them comfortable and very easy to adjust. 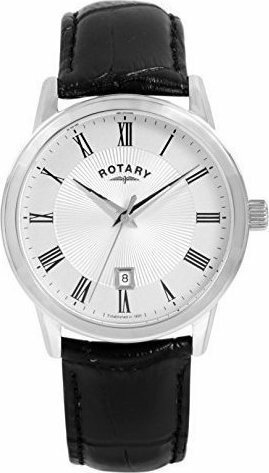 This Men’s Rotary watch is powered by a reliable quartz movement and has a basic water resistance rating. As always, I’d like to say a massive thank you for taking the time to read through today’s list of some of the best watches under £100. Of course, there were the odd few watches included above this budget just to showcase what going a bit above this price limit can achieve. If you found this list helpful comment below and let us know.